Ahh, the first day of school. I am lucky enough, I mean, the girls are lucky enough ðŸ˜‰ to have the freedom of wearing what they want to school so I always make Azy a dress. Well, this year was extra special. Because, this year, I picked out the perfect first day of school dress pattern: the Eleena Dress by Olga of Coffee + Thread, AND (for the first time ever) I had two lovely ladies to sew first day of school dresses for! Which also meant I needed to sew up another Elm poncho (by petite a petite + family) as well! I always have mixed feelings about the start of a new school year. A new school year has all the promise of resolutions of an actual New Year (which is thrilling! ), however, I'm going to miss all the undivided time with my kiddos! Yep: KiddoS! Plural! I have two going to school now! Man does stir up emotions! I just wish I could keep them at home forever! Sephira is so strong-willed and intelligent, very sweet and delightfully off-beat, and, as much as we are going to miss being with each other all the time, she is going to just flourish. I wanted to pick a pattern that epitomizes the idea of a sweet school dress. I got it stuck in my head before summer even started that I wanted to make Eleena dresses. That darling little pleat and the crispness of the pointed collar combined with a simple silhouette that just grazes the top of the knee...SWOON! I did the same size (5) for both of them but changed the lengths of everything to an eight for Azriella. I also adjusted the collar patterns to help accommodate the differences the two had in necklines. Fabric was more of a mental challenge than anything because I wanted to sew specifically from my stash. I wanted the dresses to invoke the same emotions but not necessarily match each other. I was stumped. I either had not quite enough or it wasn't the "it" fabric. I was in a quandary! For Azriella's dress, I had real "make it work" moment. I had been hoarding a stash of scraps I had from the Thomas Knauer braille quilt tour that I was a part of ages ago. 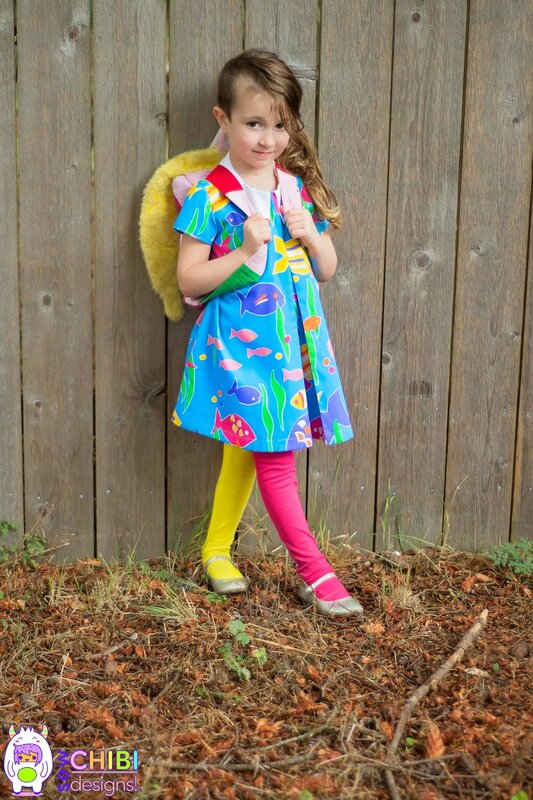 I was always waiting for the perfect excuse to cut into all of my lovely, rainbow scraps and realized that all of the fabrics combined would make a really special school dress! I improv paper pieced them all together by tracing out duplicate copies of the pattern pieces and then sewing directing onto to those pieces. I kept her collar simple but eye-catching in a sky blue Kona cotton. I couldn't be more chuffed with how it turned out and neither could Azriella! Wracked with the same fabric issue, I scoured my stash looking for something that was sweet enough (and long enough!) to be a very first day of school dress. And then I remembered it. Every Mother's Day, Jon and the girls sneak off to one of my favorite little fabric shops, the Knittin' Kitten, and they pick out a bevy of goodness for me. All of the fabrics are vintage and there is soo many good things there! Well, I remembered my favorite one from this year: it was a brightly colored fishy fabric that Sephira had picked out. And, it happened to be just enough fabric for the dress! How perfect is THAT!?! I finished it with a swiss dot white cotton collar. How about those tights!? Those are the over the knee option from the Wolf + the Tree's Abby Sock PDF Pattern! So many looks to choose from, but the girls and I all actually agreed on the same one! I had to take them in around the ankles and feet to get the fit just right but it was such an easy and quick sew that it wasn't a big deal at all. I went with all red, lacy sweater knit for Azriella because I figured it was already a busy look that I didn't want any competing elements. BUT, for Sephira, I wanted to juxtapose the sweet vintage dress with mix-matched socks. I think combined with her rad side-shave and darling side ponytail that this look couldn't be more iconically "her" for her first day of school! Living in the PNW, it is essential to have protection from the rain since it rains basically 6+ months of the year. Having something that's multifunctional as a flannel lined, waterproof poncho is the perfect thing to have on the ready for school. We have used Azriella's poncho every other day of the school year for the last two years. So when I thought about school supplies, ha, I considered making sephira her own poncho. Ironically I found a complementary Tula pink laminate cotton to what I used for Azriella's poncho and on sale at that! This being my fourth Elm poncho (can't help but love it!) I've gotten pretty good at making them. One thing I made a note of about the welt pocket option is that you only need two welts, not four. Oh, and I don't do snaps for the front panel. Since the kids se getting so much use out of them and they're not the best and unsnapping things nicely, I sew a long strip of velcro down the front. Sure it's not as polished, but I'd rather not have a hole where a snap once lived in my pretty poncho! I love how well all the pieces go together and how complete the pattern is! Sephira was so proud to have her own poncho and it is, most certainly, my best one yet! Oh geez, I miss seeing this little face every second she's away! The sky got so dark so fast during the first attempt at pictures the day before! I was literally chasing the sun the whole time! 1.) give each other a hug! 2.) look left! 3.) look right! 4.) look down! But these two sweet goofballs pulled some of the cheesiest, hilarious, adorable poses that there was nary a moment that wasn't spent trying to tame the laughter and tears! But, they managed a couple magical shots as well! I just love these kids so damn much! If I have the planning and the organization skills, I would homeschool in a heartbeat! Azriella has already protested that idea, though! Sad! Nothing left for me to do but get focused and make some creative noise! What are some of your go-to patterns for back to school sewing!? I have some backpacks in the works but I love to hear what's on your cutting table! Older PostSummer Swimwear Tour 2016! A Pattern Review!